You may have noticed that across the other side of the globe, there has been much talk about who will win the race into the Oval Office. However much closer to home, there has been even more talk and excitement about our own oval! You may have also noticed recently that along with the usual cup full of sand, your child is now coming home with tiny black rubber particles in their shoes as well! 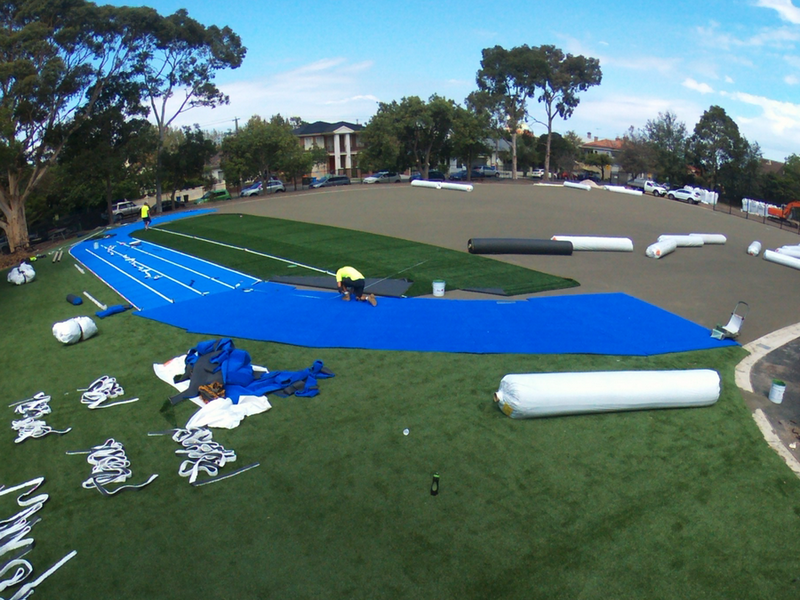 The good news is that this means that our new oval is open and ready for action! Over the past few weeks we have all been waiting patiently for this to occur, the whole process being monitored by students like clockwork. Teams of them watching through the fence each day keeping an eye on developments like any good project manager does. We were even spoilt to receive regular aerial updates of this progress via our very own local resident drone pilot (thank you Flying Officer Roach!). Then the minute we were given the all clear by ground control we parted the temporary fence and our students were able to finally enjoy the spoils. I must admit it was a very memorable day when our students were “unleashed” onto the oval for the first time. Word got out pretty quick and grade by grade raced down to gain access for the very first time. Watching closely I noticed that there was a number of different trends in the way our students reacted to this new environment. The favourite approach was to run a lap or the track, others reached down and ran their hands through the surface, some bounced up and down (it is very spongy!) and a couple even took a long jump into the new pit. Then when the fences were removed and the goals went up the footy and soccer balls took centre stage. What a great space for our school and our community. From every angle I can find it looks awesome. The whole space is a credit to our school community. For many years our parents and staff have been actively involved and dedicated to redeveloping this space. The community has invested countless hours researching, consulting, planning and fundraising. It is now a great space for all of our students and for our whole school community. To celebrate and acknowledge the effort of the many people who helped get this project delivered we will be holding a short opening ceremony this Friday 15th April from 3pm. This event is being run by our Year 6 Leaders. 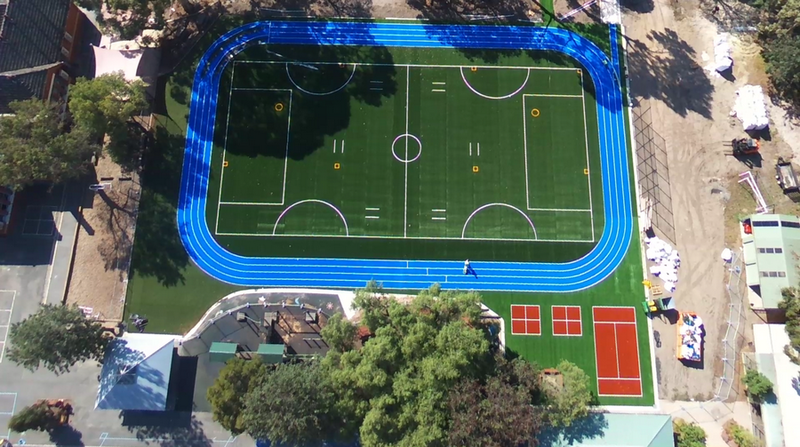 The assembly will include traditional items such as speeches and ribbon cutting, but also some not so traditional items such as students versus teachers relay race and every student running a lap of the track to music. I hope we can find Chariots of Fire! After the ceremony we invite families to stay a little longer and enjoy the space together. By the way for those of you who love facts and figures, here are some key numbers about our oval. 55 Tonnes of sand was used in the construction (25kg sand per square metre on the track and 14kg per square metre on the longer surfaces). 14 Tonnes of rubber was used in construction (8kg per square metre on the infield area). The length of the track is 164 inside lane and 268 in the outside lane. (Note there is 100 metre lines marked out in each lane. They are the staggered start lines on the side of the track that is closest to the main building). 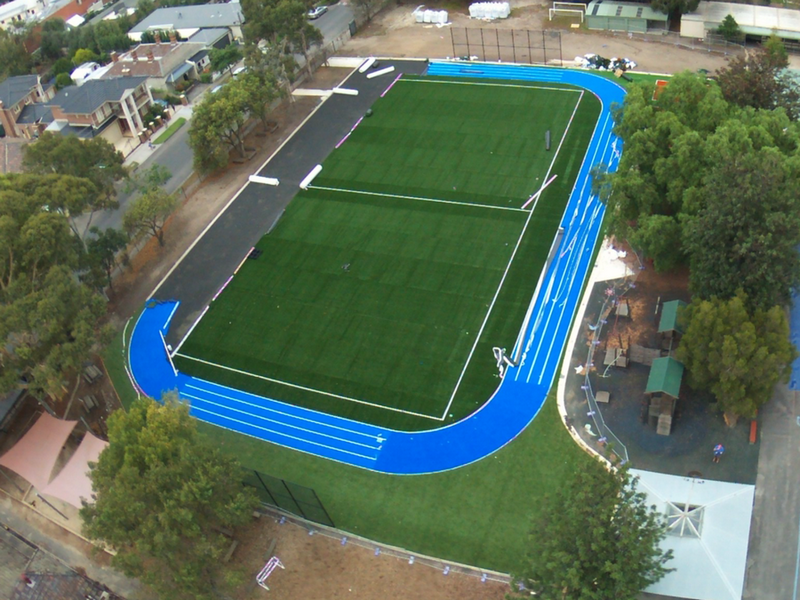 To run 1 kilometre you will need to complete just over 6 laps on the inside lane. The track and court sections are made from 19mm multi-sport Tournament surface and are 1,064 m2 is size. The section closest to the North end is the longest pile at 44mm and is called Summer Envy. This area is 286m2. The line markings include 1 x min soccer 51m x 25m, 2 x mini soccer 25m x 25 m, 3 x cricket pitch markings, 2 x rounders, softball 16m x 16m, 4 square and hot shots tennis court. The surface will have 2 services per annum to ensure that the synthetic grass stays looking good all the time and for years and years to come! Well done and thank you again to everyone that was involved. I may not be in the race for the Oval Office but when the bell goes for recess and lunchtime I will be racing out with our students to enjoy our oval! This entry was posted in Fundraising, School Grounds & Facilities and tagged Fundraising, learning spaces, oval, sports by Kate W. Bookmark the permalink.